Over the last couple of years, I have focused more on looking at butterflies, so today I visited the Queen Elizabeth Olympic Park, to see what I could find there of these beautiful creatures. Conditions were butterfly-friendly, ie very sunny and hot, with lots of wildflowers still in bloom for them to visit for their fill of nectar. During my afternoon at the park, I noted 5 Meadow Browns, 20 Gatekeepers, 2 Peacocks, 1 Red Admiral, 14 unspecified ‘Whites’, and 200+ Common Blues – definitely the most frequent butterfly-ers of the day! 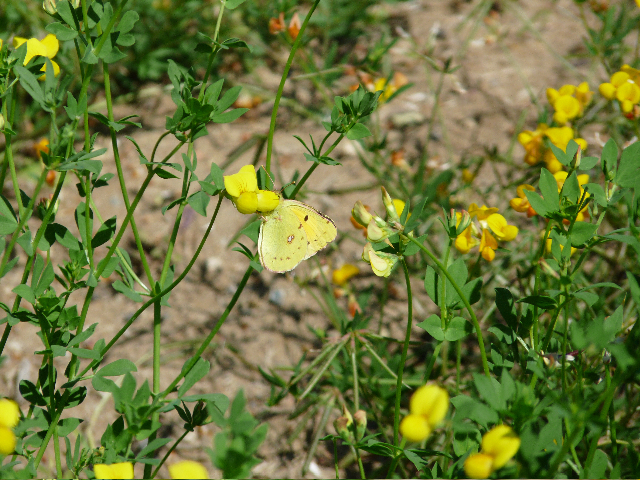 However, my ‘star butterfly spot of the day’ was a Clouded Yellow – my first time seeing this particular butterfly, and by the end of my visit, I had seen 11 in total. The only other yellow butterfly I had ever seen before was the Brimstone, but the Clouded Yellow is quite different – a deeper, ‘buttery’ gold kind of colour. The Brimstone is a much paler yellow. According to one of my butterfly guide books : “The Clouded Yellow is a well-known but unpredictable migrant to Britain, and occasionally arrives in huge numbers. However, most years only a few arrive from the Continent.” So, although not rare, it seems it is fairly uncommon to see. It certainly made my day to see it, or should I say, them!